Having booked on the BMS Dung Fungus Workshop, to be run by Mike Richardson during October 2013, I duly started gathering. Mike had asked attendees to collect samples of herbivore dung before the course commenced and advised us to incubate them on damp towel paper in containers with clear lids, as the fungi need light. The containers must also be shallow enough for the contents to be viewed under a dissecting microscope without disturbance. Three Surrey sites were chosen for the collection of dung, two of which are National Trust properties where I had already been surveying the fungi and felt that records of coprophilous species would extend the scope of these studies. 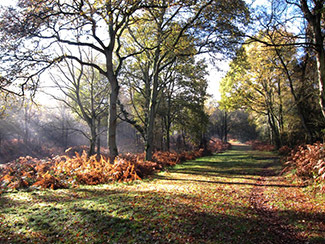 Holmwood Common is a National Trust property largely covered by oak woodland but also interspersed with glades and rides (Fig 1). 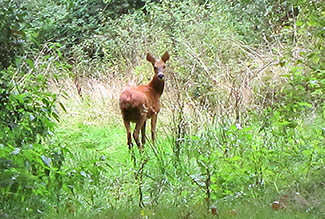 Roe deer (Fig. 2) are a frequent sight on the common and the rabbit population helps maintain the grasslands. Samples of dung from roe deer, rabbit and a passing horse were collected. 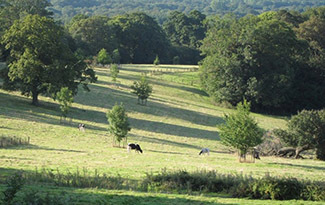 The second site is known as The Parkland and is largely made up of unimproved grassland of considerable age: it forms part of the Leith Hill Place Estate, Ockley, which dates back to the mid-1600s. Leith Hill Place was the childhood home of the composer Ralph Vaughan-Williams, who donated it to the National Trust in 1944 (Fig. 3). Richard Keen and his wife Charlie, tenants of the adjacent Etherley Farm, manage The Parkland under the Higher Level Stewardship agri-environment scheme, run by the Department of Environment, Food and Rural Affairs. Dung was collected from the cattle and sheep that graze the parkland. The third site is a private property in Westcott where the owners keep horses. The animals and the land are managed in an environmentally friendly way with herbal treatments and good husbandry employed rather than over-reliance on veterinary drugs. Coprophilous fungi play a most important role in the decomposition of animal dung and they have evolved a range of strategies to ensure their success. These include being phototropic, having sticky spores and often having very dark or purple spores. During the dung fungus workshop Mike Richardson explained that the pigmentation is believed to protect them from UV rays whilst out on open grassland (Figs. 4, 5), although this type of pigmentation is not restricted to coprophilous fungi. Coprophilous fungi have three types of life style. First are those that need to pass through the gut of an animal before they can complete their life cycles, such as members of Mucorales (e.g. Pilobolus) and Sordariales (e.g. Podospora). A second group, which includes Coprinus and allies, can survive passage through the gut of an animal but this is not essential for them to complete their life cycles. A third group is associated with dung but cannot survive passage through the gut, e.g. some members of Thelebolales. Pilobolus species, also known as the hat thrower fungi, are famous for shooting its sporangia off at great velocity, which then stick to the surrounding vegetation. The adhesive qualities of Pilobolus sporangia are quite remarkable, as discovered when trying to scour them off the insides of their incubation boxes. They are strongly phototropic; once they germinate the stems elongate and grow towards the light (Fig. 6). This helps ensure that the sporangia will be shot free of the dung and land out in the open where they will have the best chance of being consumed by a passing herbivore. The success of these strategies is evidenced by the appearance of Pilobolus sporangiophores on most of the herbivore dung that was collected. 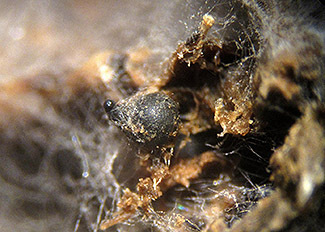 Members of the Sordariales are dark-spored, their perithecia generally blackish, pyriform and less than 1mm in diameter. 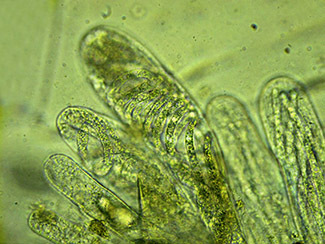 Characteristic of this group are various gelatinous sheaths or appendages attached to the spores, again an adaptation to help them stick to the surrounding vegetation once they are ejected from the ascus. 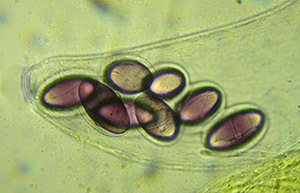 Podospora spores have both a primary appendage, which is in fact the remains of an undeveloped spore, and various arrangements of secondary appendages, or caudae, at one or both ends. These are hyaline and may need staining before they undergo the careful examination necessary for their determination to species (Fig. 7). 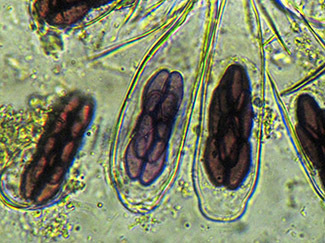 A large proportion of dung fungi belong to Pezizales, two of the commonest genera being Saccobolus and Ascobolus, both of which have purple spores. Saccobolus ejects its spores in neat bundles, which are arranged in a consistent manner within each species. Ascobolus on the other hand shoots its spores out singly. The spores of both genera have a gelatinous coating that sticks to the vegetation (Figs. 5, 8 and 9). 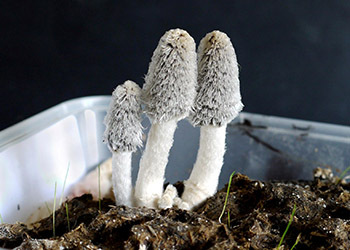 The majority of the Basidiomycetes recorded were species of Coprinellus and Coprinopsis. Some of these are generalists, for example, Coprinopsis cinerea which can grow on a range of substrates including rotting vegetation. 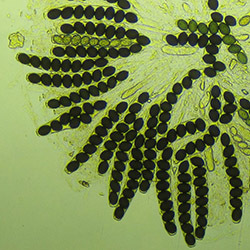 C. cinerea is the fruit fly of the fungus world being favoured for laboratory work because it is fast growing, easily cultured and its development can be manipulated. The fruitbodies have a most appealing ‘furry’ appearance when young and tend to grow rapidly to maturity overnight; a rate of 1.5cm per hour was recorded during the study (Fig. 10). Some of the fungi prefer a particular type of dung but the majority will grow on more than one. Those that occurred on the widest range were Coprinopsis cinerea; Iodophanus carneus, Pilobolus crystallinus and Sporormiella minima. The number of fungus species recorded on each type of dung is given in table 1. Dung from animals grazed on unimproved grassland will support a greater diversity than that from animals grazed on land that has been fertilised. The presence of antibiotics and other veterinary products is believed to be responsible for the decline of some coprophilous fungi as well as invertebrates and the wildlife that feeds on them. During the study it was noted that the most frequently occurring coprophilous fungi both in terms of the numbers of records and the quantity of fruitbodies, tended to belong to four orders: Mucorales (e.g. Pilobolus); Pezizales (e.g. Ascobolus and Saccobolus); Sordariales (e.g. Podospora and Schizothecium) and Agaricales (e.g. Coprinellus and Coprinopsis). In total, however, a far wider range of orders was represented; these are listed in table 2 together with the number of different genera and different species within each order. Mucorales 2 2 plus 2 vars. Studies by others have shown there to be a succession in the development of dung fungi, with the Zygomycetes, e.g. Pilobolus, appearing first, followed by the Ascomycetes then the Basidiomycetes. Whilst Pilobolus did indeed appear very soon after incubation there was quite an overlap in the emergence of the Ascomycetes and Basidiomycetes. Analysis of the records from the three study sites showed that, on average, the Basidiomycetes started to emerge a few days before the Ascomycetes. 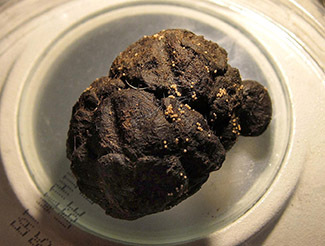 This was found to be the case whether the dung had been incubated immediately after collection or dried, re-hydrated then incubated. There are many variables that might have influenced the emergence times, such as the age of the dung when it was collected and its composition, for example whether or not it contained any supplementary foodstuffs or veterinary treatments. Pilobus appeared within two to five days but only on the undried dung, some of the Basidiomycetes started to fruit after five days on dung that had been dried then rehydrated, and whilst most developed within the first few weeks, some continued to appear for up to a year later. The first Ascomycetes appeared after eight days on previously dried dung and the bulk continued to emerge during the first six weeks. 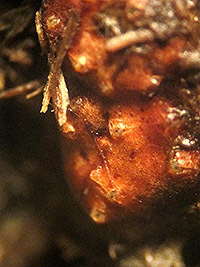 Members of the Thelebolales and the Hyprocreales were generally amongst the latest of the Ascomycetes to emerge, and as with the Basidiomycetes a few species did not appear until months after the start of incubation. 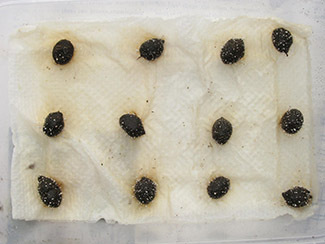 Some dung fungi are known to inhibit the growth of others; this was evident on several occasions with Coprinopsis stercorea when it was the only fungus present on deer and rabbit droppings (Fig. 11). 78 fungus species were successfully identified on the dung samples but a number of others eluded determination. Fungi on dung are under-recorded so it is not all that surprising that around 30 of those identified are apparently new Surrey records, based on the Fungus Records Database of Britain and Ireland. A selection of the uncommon or new Surrey records is detailed below. 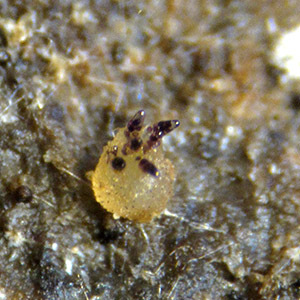 A couple of perithecia found on cow dung last year were soon identified as Zygopleurage, a genus that had not previously been recorded in Britain. However, despite Dr Brian Spooner’s and my best efforts it was not possible from the available material to make a positive determination to species level. Microscopically, Zygopleurage is a very distinctive genus; each spore has two cells separated by an intercalary membrane, giving it the appearances of a bolas. In the hope of finding this fungus again, cow dung was collected from several locations within The Parkland this year. Gratifyingly more perithecia did indeed develop. 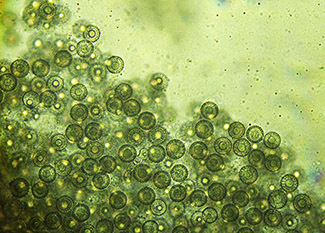 Examination of the new material has shown that it is undoubtedly referable to Z. zygospora. The epithet ‘zygospora’ relates to the way the young spores coil around each other whilst inside the ascus. The mature polar cells are dark like other members of the Sordariales. (Figs. 12, 13). Cercophora coprophila has black perithecia with a dense covering of whitish hairs. (Fig 14). 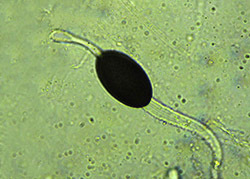 The spores are diagnostic, being elongated when young with a hockey stick bend at one end and long appendages extending from both. (Fig. 15). Being rather like an orange maize kernel in appearance I initially suspected the Selinia pulchra to be something a cow had eaten; fortunately it was recognised by Mike Richardson. Once mature it became apparent that it was in fact a member of the Hyprocreales with typical ostioles and immersed perithecia (Fig 16). Roumegueriella rufula is another distinctive member of Hypocreales that was found growing on and within sheep droppings. This forms spherical cleistothecia about 0.3mm in diameter which gradually darken from white to yellow (Fig. 17). 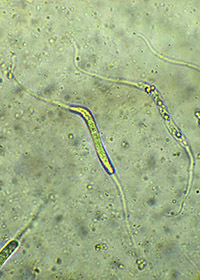 The ascospores are also yellow and globose, with thick walls and a large guttule (Fig. 18). To conclude, studying dung fungi is an enjoyable occupation that can give the opportunity of a mini-foray at any time day or night in the comfort of one’s own home. The study of dung fungi is not strictly an autumnal activity; dung can be collected and studied at any time of year. However, many of the records in this study were made during autumn. Bell, A. (c1983). Dung Fungi, an illustrated guide to coprophilous fungi in New Zealand / Ann Bell. Victoria University Press, Wellington. Bell, A. (2005). An illustrated guide to the coprophilous Ascomycetes of Australia, CBS Biodiversity Series no. 3. Centraalbureau voor Schimmelcultures, Utrecht. Doveri, F. (2004). Fungi fimicoli Italici: a guide to the recognition of basidiomycetes and ascomycetes living on faecal material: Guida al riconoscimento dei Basidiomiceti e degli Ascomiceti che vivono su materia facale. Associazione Micologica Bresadola, Trento. Ellis, B.M. & Ellis, J.P. (1998). Microfungi on Miscellaneous Substrates: An Identification Handbook: the enlarged edition. Richmond Publishing Co. Ltd., Slough. Lundqvist, N. (1969). 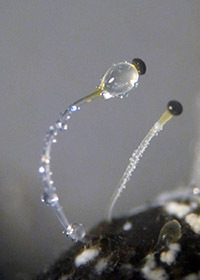 Zygopleurage and Zygospermella (Sordariales s. 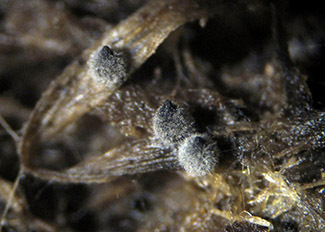 lat., Pyrenomycetes). Botaniska Notiser 122: 353 - 374. Lundqvist, N. (1972). Nordic Sordariaceae s. lat.. Symbolae Botanicae Upsalienses 20: 1 - 374. Pukkila, P.J. (2011). Coprinopsis cinerea. Current Biology 21(16): R616-R617. Richardson, M.J. & Watling, R. (1997). Keys to Fungi on Dung. British Mycological Society, Stourbridge. Spooner, B. & Roberts, P. (2005). Fungi. HarperCollins, London. Stajich, J.E. et al. (2010). Insights into evolution of multicellular fungi from the assembled chromosome of the mushroom Coprinopsis cinerea (Coprinus cinereus). Proceedings of the National Academy of Sciences of the United States of America 107(26): 11889 - 11894.